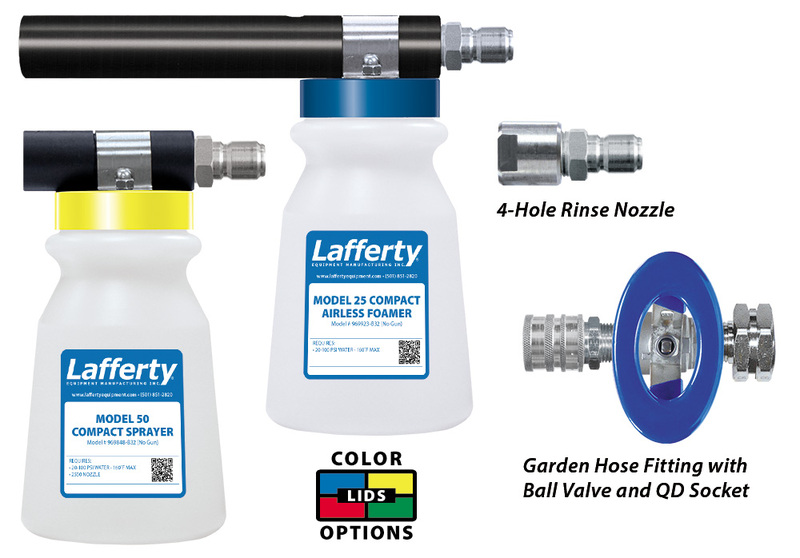 Compact Model 25/50 Airless Foamer / Sprayer / Rinse Kit W/ SSBV | Lafferty Equipment Manufacturing, Inc. Compact Foamers and Sprayers are a convenient alternative to wall-mounted Foam / Rinse / Sanitize systems. These medium-volume, hose-end, venturi injection units use city water pressure (20 - 100 PSI) to draw chemical concentrate from the attached bottle and blend it into the water stream. With the Model 25 Compact Foamer attached, the accurately diluted solution flows through the foam wand to create a clinging, wet foam which is then projected on to any surface up close or at distances up to 12 feet. Quick disconnect the bottle and foam assembly to rinse through just the trigger gun. Quick connect the Model 50 Compact Sprayer to dilute and apply sanitizing solution as non-foaming chemical spray. Quick connect the powerful 4-hole nozzle to rinse. Connects to a standard garden hose or 1/2" MPT and allows for easy activation, even with thick gloves.